The Inter-House Swimming Carnival was held last week on Friday 15 February. All students in the College had an opportunity to be involved. The Prep/1/2 students participated in a variety of different novelty events. The students from Years 3 to 12 competed in freestyle, breaststroke, backstroke and butterfly races. In addition some fun activities were included, such as kickboard and speedboat relays, medley and freestyle relays. Lots of cheering created a deafening roar as the teams encouraged the swimmers to the end with some very close finishes. Once again we should recognise the value of the free swimming program provided by the College in the indoor heated pool. The College now has three fully qualified swimming teachers on staff: Michelle Ferrari, Jan Ratcliff and Rebecca McKenzie. If you see them around, please thank them for their efforts. This year we also gave points for showing good team spirit, that will contribute to a “Spirit Cup”. So far Blue House has 55 points and Red 30 points. Everyone who participated deserves a big congratulations for their efforts. At the end	ERIC THE RED had 287 points. The current practise is to award the best two performing participants in four sections, the Primary and Secondary for both boys and girls, with a Champion and a Runner-up. When two competitors had the same points, they were awarded equal Champion. At the carnival two New Records were set by Bryce Bridgeman. In the Backstroke, his time was 12.77 seconds, which broke a record set in 2010 by Daniel Lasarow (time of 16.15 seconds) by more than three seconds. Bryce’s time in the Individual Medley was 1:19.77 minutes, nearly two seconds faster than the record held by Stuart Robertson since 2010 (time 1:21.00 minutes). Congratulations Bryce on the amazing swimming and these two fantastic times. An additional report is provided with all the best results of the day, and showing the current records for the Inter-house Carnivals. I am sure you will enjoy seeing some familiar names in the report! 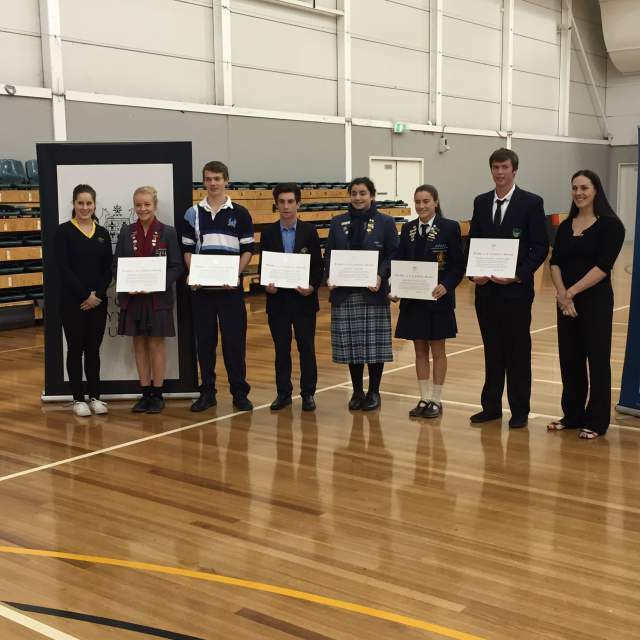 It shows the outstanding performances of many students over the years. 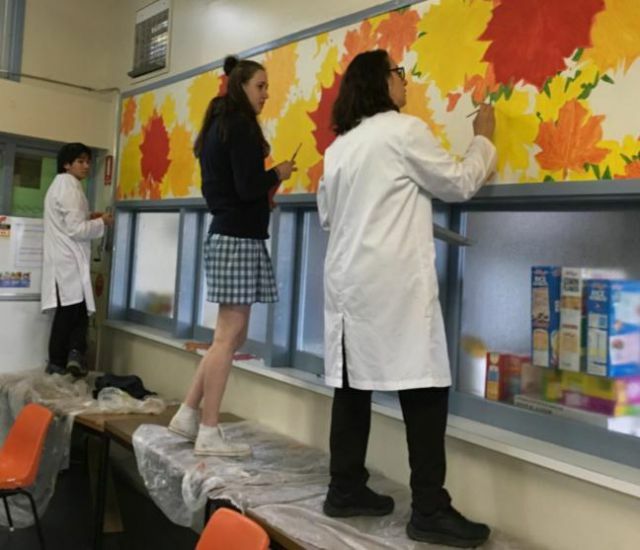 Leadership would like to thank staff who worked tirelessly to tidy up the corridor and the foyer after the building works, and for students and their patience whilst it was being completed. 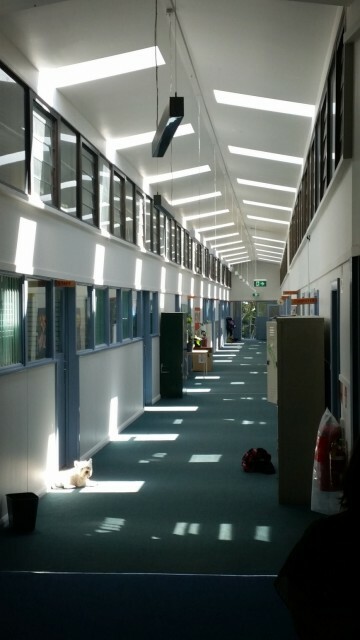 The west corridor is now amazing, we are very happy with the result, as are our students. Leadership would like to thank Adi Gilbert and Andrew Kohane for all their work in getting these works planned and organised. 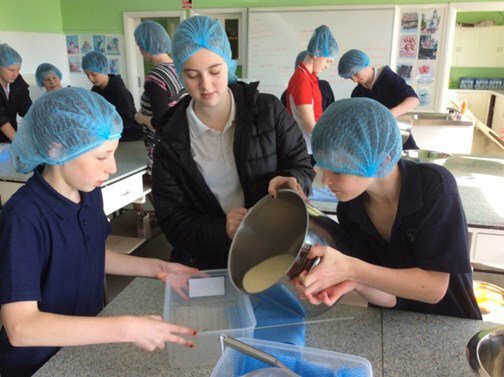 Middle Years students have been learning about chemical processes like fermentation, coagulation and separation techniques through our unit ‘Catering With Chemistry’. 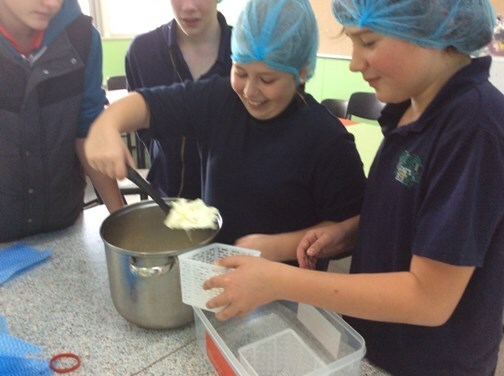 In the photos, the students are learning to make cheese (feta and a soft spreadable cheese called quark). They are also using the process of fermentation to make ginger beer and sour dough bread. It’s been great to learn how chemistry works in everyday situations. Sending out a huge thank you to Katherine for all her help. Thanks also to Sue and Ron Harrington for supplying the creamy milk to make the best cheese and to Melissa Potter, Kirrin Brown and David Gilbert for sharing their scientific expertise. Thanks also to the team at Apostle Whey for showing us the ropes. Lavers Hill staff had a most productive Professional Learning day on Friday June 10 2016. It was a valuable chance to reflect together on how all our students are progressing, our achievements together and future planning. Our New School Improvement Team (Missy, Helen, Kirra & Eve) facilitated our reflection on what we thought were the current strengths (balloons) and challenges (weights) facing the College. After a detailed and engaging process that came up with over 20 suggestions we synthesised areas and came up with a leading focus. Together we agreed to work on developing a ‘school culture based on a love of learning and pride in learning’ and how we can support and inspire our ‘students to take responsibility for their learning and develop their capacity as independent learners’. This goals aligns well with our College vision and we look forward to keeping parents and our community in touch as we build these invaluable qualities and skills. 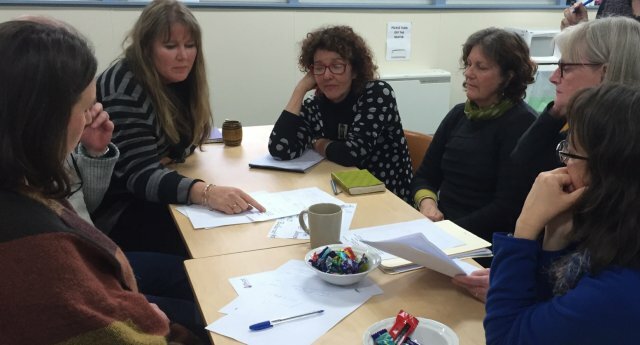 In the afternoon all staff worked together on plans and for a unit of work based around the concept of ‘Diversity’. We used hexagons to identify connections across the Learning Communities and to explore shared learning experiences for Term 3. 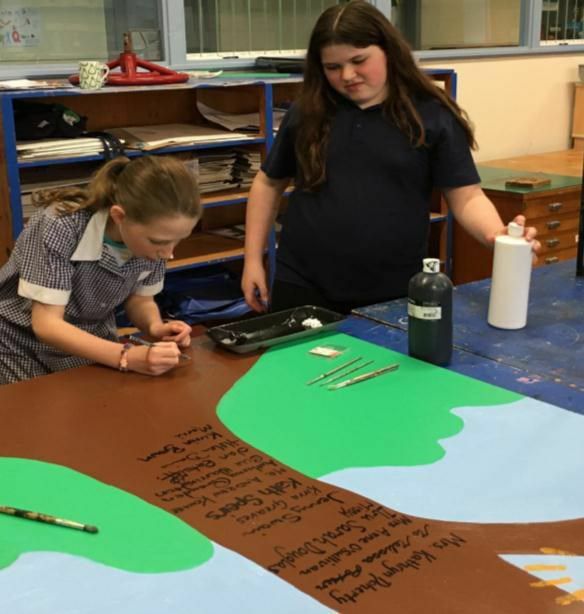 Students will also be actively involved in planning the unit and we look forward to sharing the developing ideas with parents and involving our community. 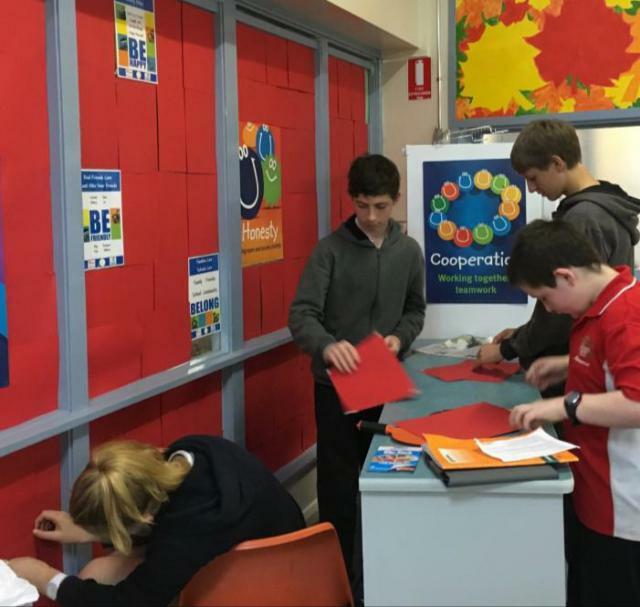 A group of six students from Grade 5 – Year 11 formed our project team in Term 4 2015. After a few brainstorming sessions the idea of redesigning the Canteen space emerged. This has included the painting of 2 new murals and purchasing new furniture. Dakota, Zoe, Tom, Harrison, Ella and Sophie – the core team met together each week to brainstorm, gather input from other students, design and implement the project. Launch. We can’t wait to celebrate with the whole School Community! Denise’s vision and leadership pioneered the Turning Point education programme, which provides young people with an alternative pathway to completing their education. 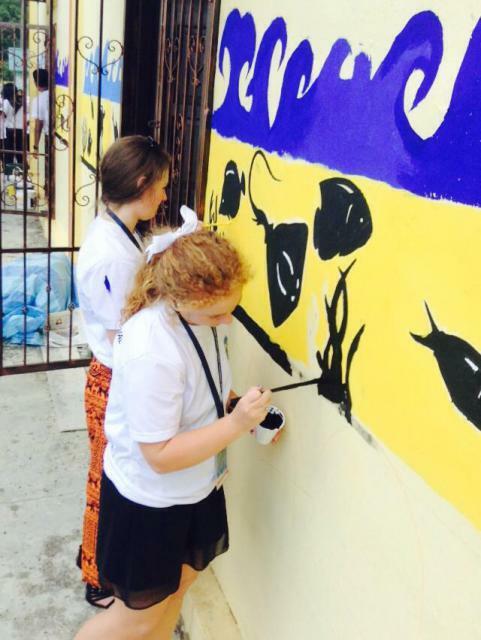 A team of teachers, social workers and business volunteers support the students to help them realise their potential. Lavers Hill Consolidated School was Denise’s first teaching appointment (1977-79) and she has taught here again since 1988. 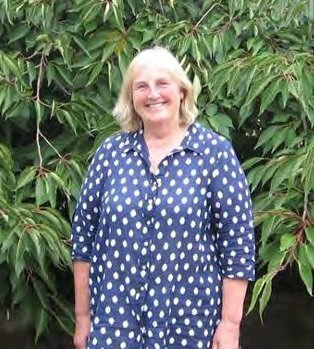 Denise has also contributed to many other areas of the local community, including 20 years on the Otway Health Board, a member of the Southern Otway Landcare Network for 14 years. She is also a life member of the Apollo Bay Pony Club, and the Apollo Bay & District Agricultural Society. 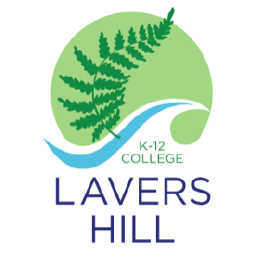 Lavers Hill K-12 College continues to forge ahead with innovation and relentless quest for excellence. Students from the Middle Years 5-8 program joined our Korean partner school in a highly successful digital link last Wednesday. Gancheon Elementary School in Daegu, South Korea taught us a traditional dance featuring elaborate costumes and traditional music. Our students responded with a comprehensive video presentation featuring the unique flora and fauna of our local environment. The response from the Korean students was quite animated and they were clearly engaged in activity. 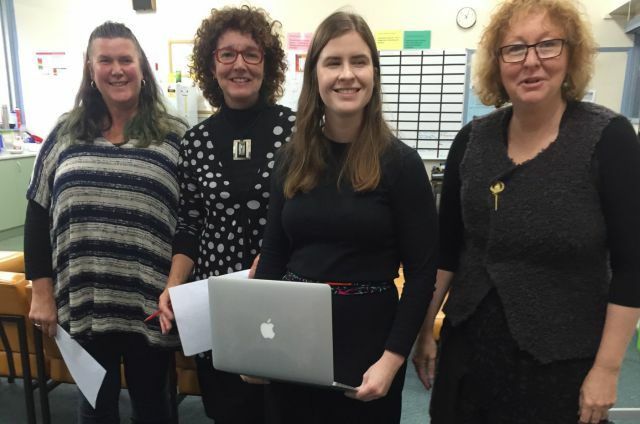 This was followed up on Friday when our school was represented in a formal signing of a memorandum of understanding between all the schools in both countries involved in the project. This was again facilitated by the use of digital technologies. It was very moving to witness the genuine commitment all participants have to promoting respect, understanding and educational opportunities for students. 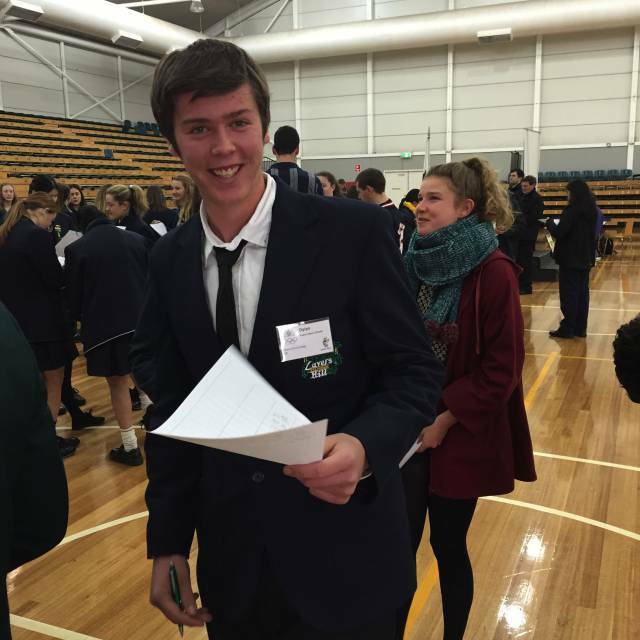 A team of Lavers Hill secondary students attended Central Reserve in Colac on Friday 27 April, 2018 to compete against representatives from Apollo Bay, Lorne, Colac Secondary and Trinity Colleges. It was a glorious sunny day for this annual extra-curricular event. There were some fantastic results achieved and a wonderful supportive atmosphere between competitors. It was pleasing to see the efforts of our students who gained a place by performing very well at the Otway Athletics. As you will see below our competitors obtained many “first” places. This is a truly amazing effort when you consider they competed against the best athletes from some much larger schools. If they choose they can compete in the next level of competition, which will be in September. I congratulate all students for their participation and results. The excellent performances by Ella and Zoe deserve special mention. Both achieved the award of Age Group Champions on the day. Ella Brauer = 13 years Female Champion with 88 points. Zoe Brauer = 20 years Female Champion with 168 points. Well done Ella and Zoe. 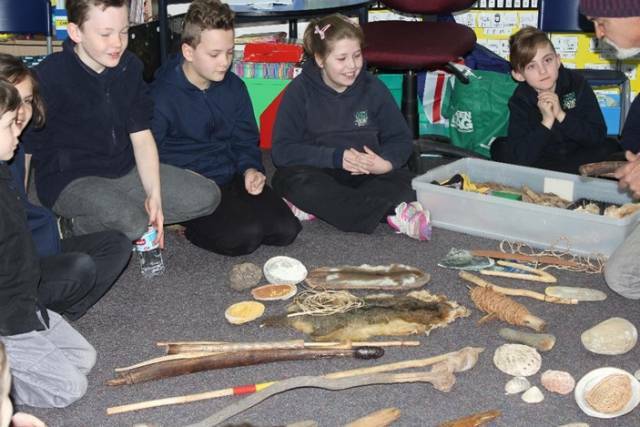 We were very fortunate to have Richard Collopy come in and share with us his knowledge of Aboriginal culture. Here is a picture of our artwork that we created with Richard to celebrate National Aboriginal and Torres Strait Islanders Children’s Day. 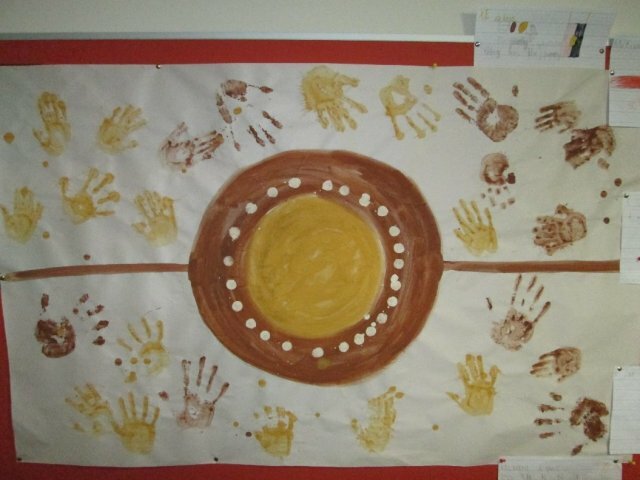 The gold in the centre of our artwork represents the school, the brown represents the land and the dots on the land represent each child who was involved in the painting. The artwork was divided in half, the bottom half represents the ocean and the top half represents the trees. The students then put their handprints on the side that best showed where they belong. A beautiful piece of work that is on display with some of our writing down the corridor. Our Dylan is an award winner! Last week I departed from Melbourne’s Tullamarine Airport at 12.05am Saturday morning to begin my journey to Malaysia. Including myself there was a total of 4 students; Jemma Walsh, Sarah Nash, Mitchell Poulton and myself, alongside our fabulous mentor and Rural Youth Ambassador Co-ordinator, Phil Brown. The journey started officially when we made a safe and early morning arrival on the ground in Singapore at 8am, leaving most of us sleep deprived and time disorientated. We had to cross the border to reach our destination of Johor in Malaysia, which took more time than intended when we became caught in a traffic jam. We arrived at our hotel at approximately 11:00am, with the rest of the afternoon spent testing Malaysian food in the buffet and wandering the alley ways and streets. Anything that would help keeps us occupied and not fall asleep, we were determined to not let jet lag get the better of us! 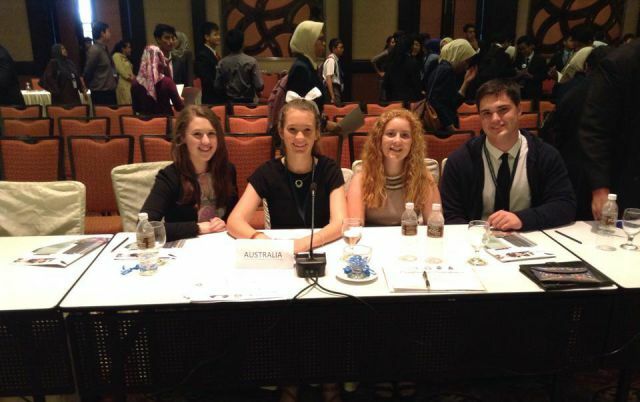 The conference commenced on Sunday Night, with a beautiful welcoming ceremony and dinner. It included around 90 people who were involved in organising the event and those, like ourselves, who were going to be presenting within the next few days. Everyone involved in the event were no older than the age of 18, they were all magnificent, motivational and inspirational youth. There were no other western countries represented at the conference, so Australia had a big role to play and we were smothered with lots of love and affection. Monday and Tuesday consisted of 2 very full days, with a total of 900 participants from 25 different countries who came together at the Johor conference to listen to the presentations and be involved in workshops. Mitchell and myself presented a 15-20 minute presentation on the topic ‘Passion in Learning’, which addressed the role and importance passion has in how we learn and how we develop. Not everyone came from an educational perspective. There was a variety of presentation topics ranging from feminism, youth entrepreneurs, technology, exchange students, nuclear weapons etc. It was fascinating to listen to the perspectives of individuals from a mixture of different backgrounds and countries and the issues they face in their communities. Australia was invited to perform a ‘cultural skit’ on one of the nights, and we came from a humorous angle with an altered version of ‘Hey Ya’ by Outcast, changed to ‘Straya’, and incorporated our own dance moves around the lyrics riding blow up kangaroos. Everyone absolutely adored our moves, and we even topped it off by wearing the classic Australian white singlet and footy shorts/cricket pants. 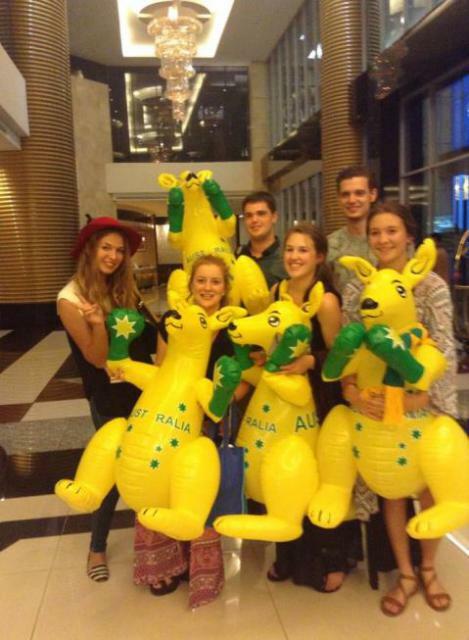 As an appreciation, we handed out our large blow up kangaroo’s to a few very special people who made a significant impact on our time spent there. Other countries performed cultural dances, much more graceful than ours and some sang and played musical instruments. It was a beautiful night, with lots of laughs and bonding, and Australia even ended the night with our spontaneous dance lesson to the Nut Bush! The weather was a real challenge to get used to, with temperatures never dropping below 26 degrees, and thunder and lightning hitting every night around 5pm. Malaysia has only a time difference of 2 hours behind Australia, however the days certainly felt much longer with very few days to adjust before heading home. 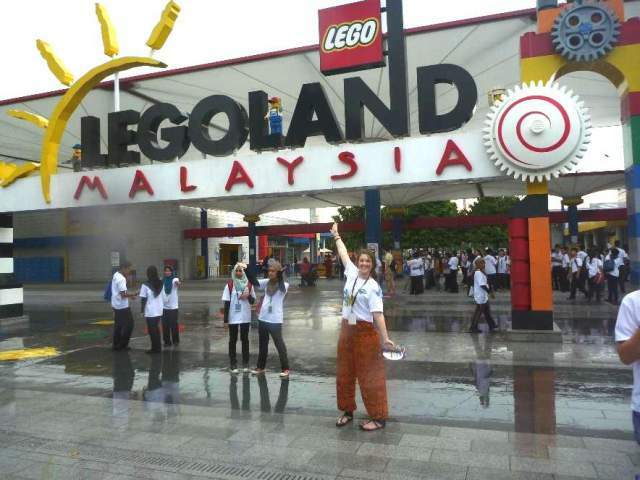 We all made very close friends with a group of exchange students who have been living in various parts of Malaysia for 11 months, with 6 weeks to go before heading home; Muriel, Daisy, Roberta and Genua. The girls came from Italy, Belgium and Germany, and shared many of their personal stories with us, both horrifying and astonishing. It was a true honour to have crossed paths with them, and we all exchanged details to stay in touch. The time spent in Malaysia was emotionally rewarding, challenging and eye opening in so many ways. We were exposed rapidly to different cultures, food, environment, and thrown in the deep end with questions left, right and centre. Everyone wanted to know all about Australia, as much as we wanted to know all about Malaysia and everywhere else. It’s very difficult to put into words what I learnt, and how it changed me, because I’m still trying to come to terms with it all myself and convert everything I’ve seen and heard into a manageable explanation. It was frightening to hear stories of how some people have been treated, but beautiful to hear other stories of hope and determination. It doesn’t matter where you come from, what language you speak, what colour your skin is, or how you dress, each and every young person has a voice that deserves to be heard and challenged, because what I learned was when we were all put into the same room together, was that we all want the same thing. A positive change in the world where we can all be equal, enthused, passionate, safe and share our resources for the better. If a group of young people who knew each other for a total of less than 3 days can come to a respectful conclusion about change and be at harmony, than I have faith in the generation to come. The world has a lot to look forward to. Our Games Elective is up and running and many of the students are keenly playing Chess. I am thoroughly enjoying the chance to hone my skills and am playing regularly with Edward who is currently up 3 games to 2. I am not very happy with this and am very keen to get back to 3 all next week. To build on this interest we would like to invite community members to join us to help build our collective skills. If you are interested please contact the Principal. 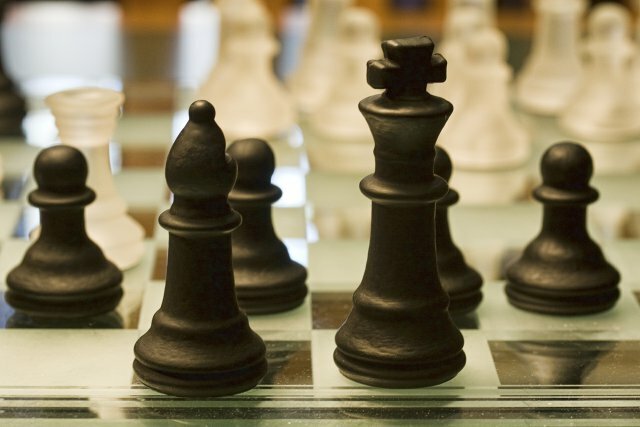 Victorian Schools Castlemaine Chess Tournament – coming up on Wednesday 20th May and Thursday 21st May. (offering $20,000 prize money). The concept grows upon the Castlemaine Community’s development of chess excellence in education on a local and global level over the past 9 years. The Challenge is funded by various private benefactors from Castlemaine, and sponsors such as Maldon & District Bendigo Community Bank. The inaugural tournament is on Prize money won at this event will be used solely for developing chess programs within schools and community. 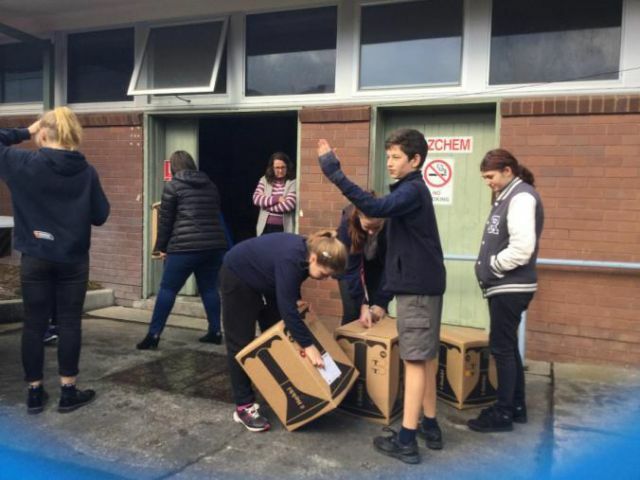 The Lavers Hill Chess Team – we will be putting a team together over the coming weeks and plan to hold a local tournament in preparation for the trip to Castlemaine. There is also an opportunity to bring a sleeping bag and sleep in one of the Old Gaol cells. This will be a free night’s accommodation for people who travel beyond 100km.